Cardiovascular disease is the #1 cause of death in all eight of our Coastal Health District counties (Bryan, Camden, Chatham, Effingham, Glynn, Liberty, Long, and Chatham). Through our health departments and other public health facilities, we promote healthy eating, moving more, and smoke-free living as part of the preventive prescription for control or against development of heart disease. While we promote these things year round, they take on even more significance during American Heart Month every February. Why Reaching Out Is GoodHaving positive, close relationships and feeling connected with others benefits our overall health, including our blood pressure and weight. Having people in our lives who will motivate and care for us helps, but having feelings of closeness and companionship helps our health too. Grab your kids, put on some music, and do jumping jacks, skip rope, or just dance. How much is enough? 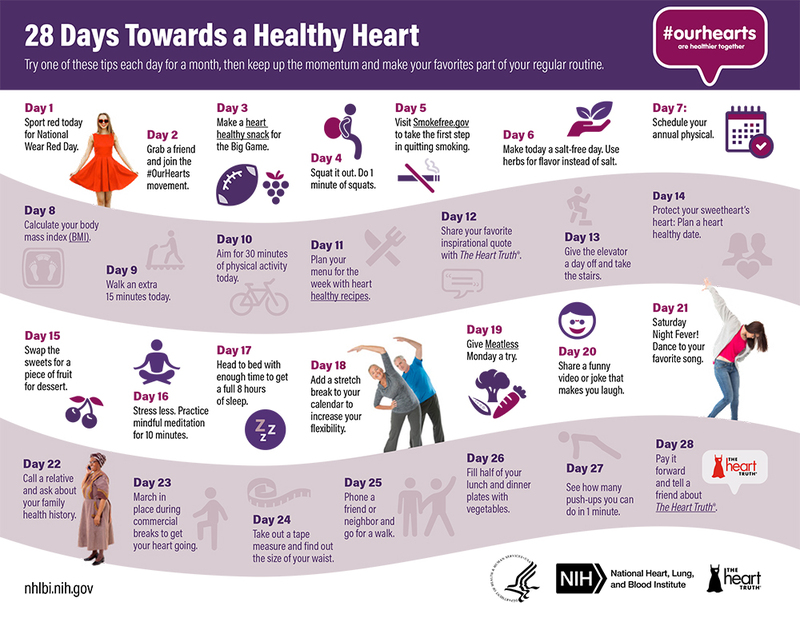 Aim for at least 2½ hours of physical activity each week—that’s just 30 minutes a day, 5 days a week. In addition, do muscle strengthening exercises 2 days a week. Can’t carve out a lot of time in your day? Don’t chuck your goal, chunk it! Try 10 or 15 minutes a few times a day. NHLBI’s Move More fact sheet provides ideas to get and keep you moving. To help you quit, ask others for support or join a support group. Research has shown that people are much more likely to quit if their spouse, friend, or sibling does. Social support online can also help you quit. All states have quit lines with trained counselors—call 1-800-QUIT-NOW (1-800-784-8669). You’ll find many free resources to help you quit, such as apps, a motivational text service, and a chat line at the websites BeTobaccoFree.hhs.gov and Smokefree.gov.